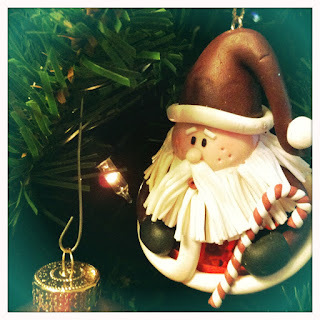 I know you have seen him before but I just love this little Santa - he is actually a bell! Sorry about the break in posts, I'm having computer issues and on a happier note the last few weeks have been packed with social activities. The dark circles under my eyes required extra concealing today and while I would have loved a few extra hours sleep, I wouldn't have given up all the fun I had over the weekend. I always find December a strange time of year. There is a certain frantic atmosphere as people rush about, finishing projects, organising presents, cooking feasts and treats. There is a certain sense of fatigue as it seems the effect of a year of work piles up. But there is also a certain joy in the air. A sense of celebration and frivolity. People walk around in Santa hats and with funny Christmas themed t-shirts. There are parties and gatherings. Christmas cards arrive in the mail and there is the anticipation of what lies in the brightly coloured parcels under the Christmas tree. It is a time of year where amidst jostling crowds of harried shoppers, Christmas carols and the excited squeal of a child who has just spotted Santa makes us all smile. We attended three Christmas events over the weekend - two end of year parties for our dance schools and a Christmas themed BBQ. Each event was full of happy people. When talk turned to work everyone seemed to heave a tired sigh but in no time at all the conversation returned to holidays and fun plans. I caught up with a friend who I haven't seen in a year and it was like no time had passed at all. I'm exhausted after a couple of very late nights but my spirit has been lifted by the celebration. All in all, it is a wonderful, crazy, frantic, joyous time of year. I love having the presents under the tree but a curious toddler and speedy crawling baby would have them destroyed in no time! Your Santa Bell is tree cute! I'm thinking the hamper of goodies may need to be removed to higher ground before my sister's dogs come over for a visit - I imagine destruction would be imminent. It sounds like you're throwing yourself wholeheartedly into that frantic but festive time - which is a good stance really, because it does only come once a year :) I like the lull between Christmas and NY and that keeps me going through the more hectic of the December periods. I like that lull too, however this year it will include two days of driving - about 15 hours in total! Still I'm sure we will have some very relaxing days in there. I love this time of the year. No matter how the year has been, it's always a time that everyone makes that extra effort to make it a lovely time for each other. Merry Christmas SSG! I so agree. I'm just loving catching up with everyone. I loveeeee Christmas! We have our tree all decorated and lit up, scenting the house with the heavenly smell of pine! There are piles and piles of presents underneath. We have Christmas wall stickers all over the dining room, entrance and up the stairs. Our outdoor deck is adorned with a massive star. And the front of the house is COVERED in lights and decorations! Oh I would love to cover the front of the house in lights! The boy does not approve, but maybe one day I will just do it anyway. I love this time of year too, but I think I could do without the overwhelming number of social functions I have to go to. How many christmas parties is too many?